Jersey have been drawn to host Channel Island rivals and reigning champions Guernsey in the EH Trophy second round. Jersey beat Lewes 4-1 on penalty strokes in the first round on Sunday after drawing 4-4 after normal time, while Guernsey had a bye. 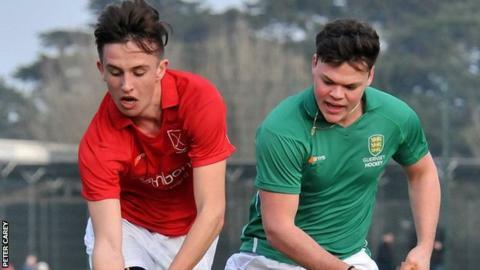 Guernsey beat Jersey 1-0 at Les Quennvais when the sides last met in the inter-insular in March, and have won their last four encounters. Guernsey beat Blackheath and Old Elthamians 7-2 in the 2016 final. Guernsey have reached the final of the EH Trophy in each of the last five years, and last month won their first-ever match in the top-tier EH Cup. "It's a team we never want to draw, but the inevitable was going to happen eventually," Guernsey player-coach Andy Whalley told BBC Radio Guernsey ahead of the game which will be played on 13 November. "There's a knowledge, we play each other a lot in the inter-insulars and island tournaments, so there's a knowledge of individual players, whereas when you're playing a UK team we won't necessarily have that. "The Guernsey-Jersey occasion tends to be a little more fraught, there tends to be a little more emotion in them and they're difficult games to play in, so to draw them in the Trophy is not ideal, but we've got a good record against them so we're confident going into it."